Swagelok SS-V2NBM12-F8-11486 Instrumentation Isolation Block & Bleed Valve 2 pk. NEW, Swagelok SS-65EF12 Ball Valve 3-Piece, 3/4"
anayongsta-0 has no other items for sale. Details about Swagelok SS-V2NBM8-F8-11486 Instrumentation Isolation Block & Bleed Valve 2 pk. 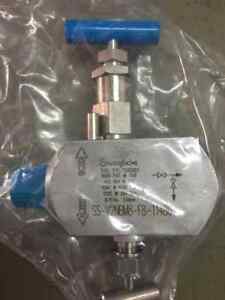 Swagelok SS-V2NBM8-F8-11486 Instrumentation Isolation Block & Bleed Valve 2 pk.